As many residents can tell by the toilet paper in some trees in Liberal, it’s Fall Homecoming at Liberal High School today. 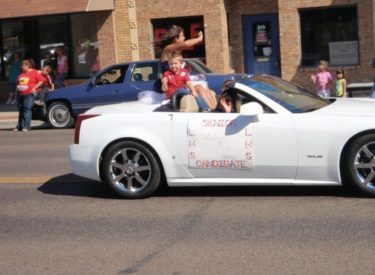 The Homecoming Parade down Kansas Avenue took place Friday afternoon. Classes were let out early throughout Liberal for the parade. Teams from LHS. WMS, and SMS were part of the parade as well as classes reuniting from the class of 1970, 1965, 1960, 1955, and several other classes from the 1950’s. Great Bend beat Liberal 42-16 in the homecoming game. Selene Perez was named homecoming queen. The homecoming queen candidates were Selene Perez, Yoko Rader, and Susan Nguyen. The junior attendant was Brianna Pena. The sophomore attendant was Viviana Ortiz. The freshman attendant was Amelia Juarez.